What is the secret to gaining membership in the 100th Birthday club? Sometimes its as simple as “cold showers”. That is at least in part to what centenarian Ed Rodnthaler owes his longevity. Ed says that when his brother returned from WWI in1918, he told his younger brother Ed, to follow every hot shower with an ice cold one, make the water as cold as you can stand it, and count to 100. Ed has been following his big brother's advice ever since. He also lives clean and has always worked, and kept his body and mind active. Now as a centenarian he walks a half-mile every day, and still writes a weekly column for his local newspaper. It used to be people couldn’t wait to retire. 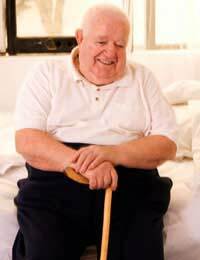 But study after study has found that the traditional view of a “sedentary” retirement may actually be the surest ticket to an early grave. There are people who have started new careers in their 80’s, even in their 90s. There are others who have never stopped working at all. Take Jack Tamis. Tamis started working way back in 1919 in what would one day become Louis Tamis & Sons Jewellers'. Right after graduating high school, he headed to his dad’s shop on New York’s Lower East Side where Louis Tamis made cigarette cases and bracelets. Jack started out sweeping floors and bringing in lunch. Today, at over 100 years of age he's still working, but now he's designing jewellery for the business. "It keeps me alive, I don't want to quit, I’m afraid of what will happen if I do” says Tamis. After many years running the company, he has now turned the day to day management over to other family members. He has moved to Florida, where he goes three days a week to his jewelry design workshop he maintains there. Up until recently, he even still drove himself the 20 minutes each way to the shop, but since having had cataract surgery, his nephew drives Jack and his wife Helen , who at 92 still handles his books, to work. His son Bill says we send him work, he makes us the pieces and sends us a bill! The first wave of “baby boomers” reaches retirement age this year; 2008. That means they could be celebrating their 100th birthday by 2040, and according to current statistics many more of them than ever before are likely to make it. It is a generation that is rethinking retirement. And while people like Jack Tamis may raise a few eyebrows and have us gasp “Amazing”, experts say we should get used to the idea of people in their 80’s 90’s and yes even centenarians drawing a paycheck. What's now considered astounding will likely soon become commonplace. Today's working centenarians are the trailblazers for those to come. And according to Dr. Robert Butler of the International Longevity Center, if current trends continue there will be a lot more centenarians coming around the mountain. By 2025, well over 300,000 people in the United States alone could be celebrating a triple digit birthday, and that number may swell to over 1 million by 2050. The US Census Bureau says there are currently 50,454 centenarians in the US, other estimates put the number as high as 70,000. According to Thomas Perls director of the New England Centenarian Study, perhaps 5 percent of them may still be working. It’s never too late to be working and be useful. Just ask Jack Tamis, who at 95 after a lifetime in the sales side of the jewellery business, taught himself to set diamonds at 95, and bought his first computer to help him design jewelry at 97. As a centenarian he has designed a unique adjustable back for clip-on earrings and created a never before seen basket-weave pattern that the company now uses for its signature gold bracelets.